Last Friday morning I drove down to Menemsha to get gas. The sign at the bottom of the hill two-thirds still missing, nearly every parking spot filled, shoppers, dog walkers, cyclists getting late breakfast at Menemsha Deli, and a painter under the tree before the creek. Walkers everywhere, cars moving slow, but I managed to turn into the Texaco station. I saw a large umbrella next to the sashimi shack, and wondered if I could pick up lunch. After pulling out, I see a painter under the umbrella, and pull as far off the road as I can. It turns out to be Brandon Newton, a Virginian native. 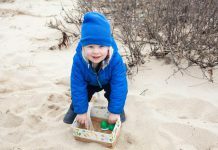 His daughters graduated a couple of years ago from the high school and the West Tisbury School before he and his family ended their two-plus year adventure on Martha’s Vineyard and moved home to Virginia. 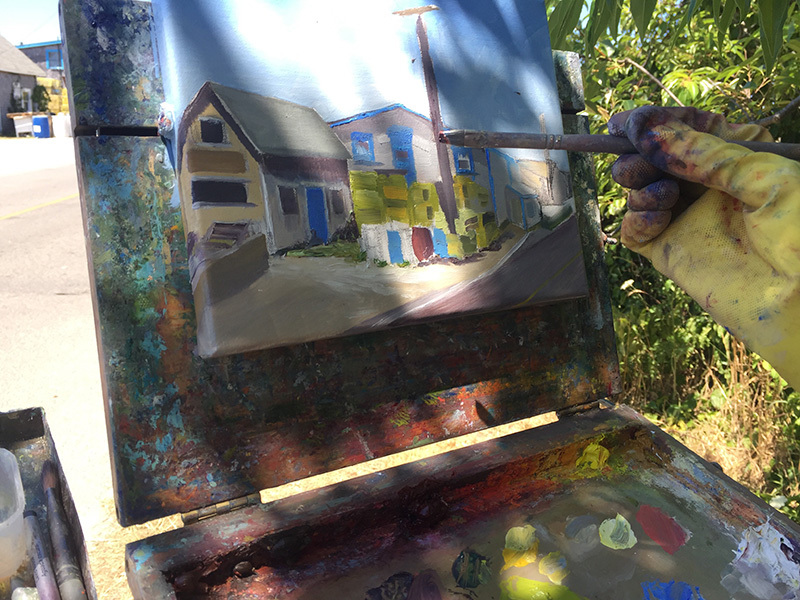 Brandon says painting outside is not what he usually does, but he tries to challenge himself when he’s here. 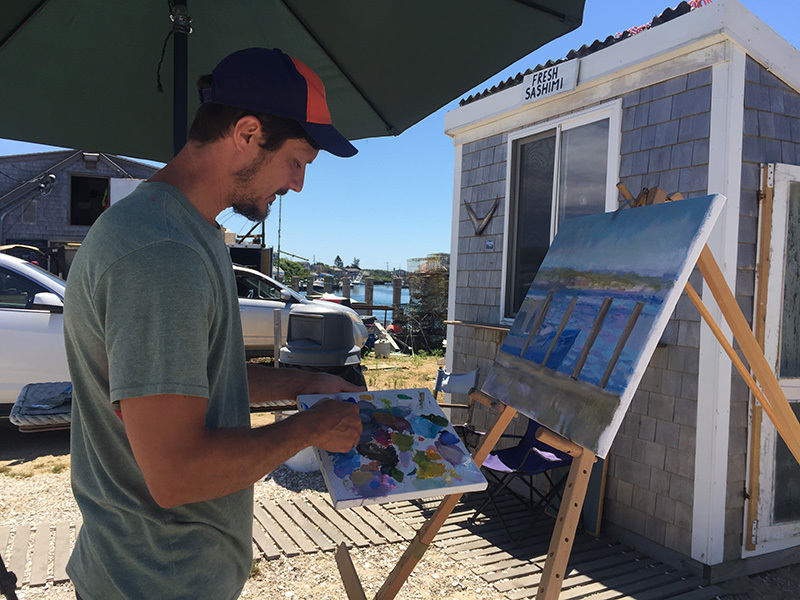 He adds, “It’s so exhilarating.” Brandon is represented by the North Water Gallery in Edgartown, where his show will open on Wednesday, August 8. 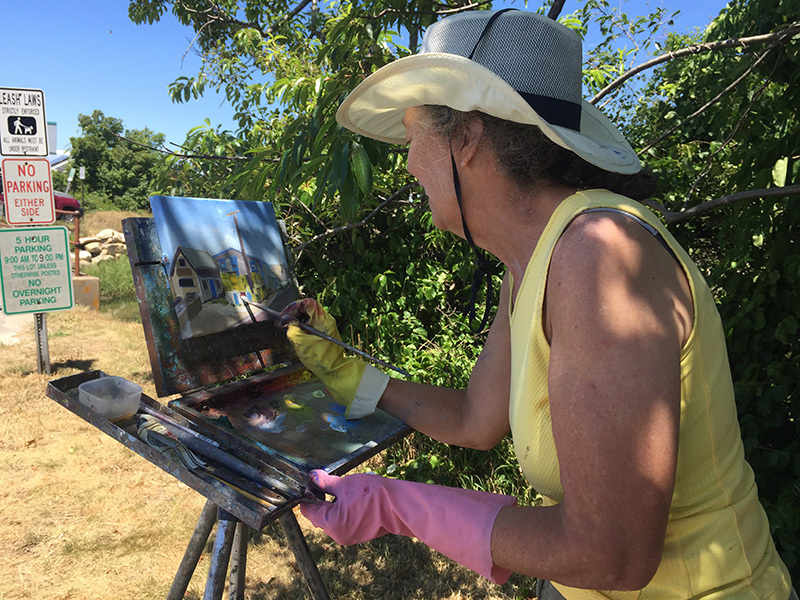 Then I head back to the first painter, who turns out to be Magi Leland, originally from North Andover, working on a small study. Magi has been coming to the Vineyard “for the past 58 years.” Her grandparents had a fishing shack at Wasque (since the 1930s), where she came for a week in the summers and never stopped. Magi was a goldsmith until she became a full-time painter 15 years ago. Magi explains she “started exhibiting with Holly Alaimo at the Dragonfly Gallery. 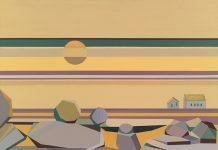 She was so encouraging, it’s why I’m a painter.” After nine years represented by Holly, Magi moved to the Gossamer Gallery owned by Joan Merry, and for the past six years she’s been represented by Zita Cousens’ Cousen Rose Gallery in Oak Bluffs. Her exhibit there opened July 21 and ran through Friday, July 27. 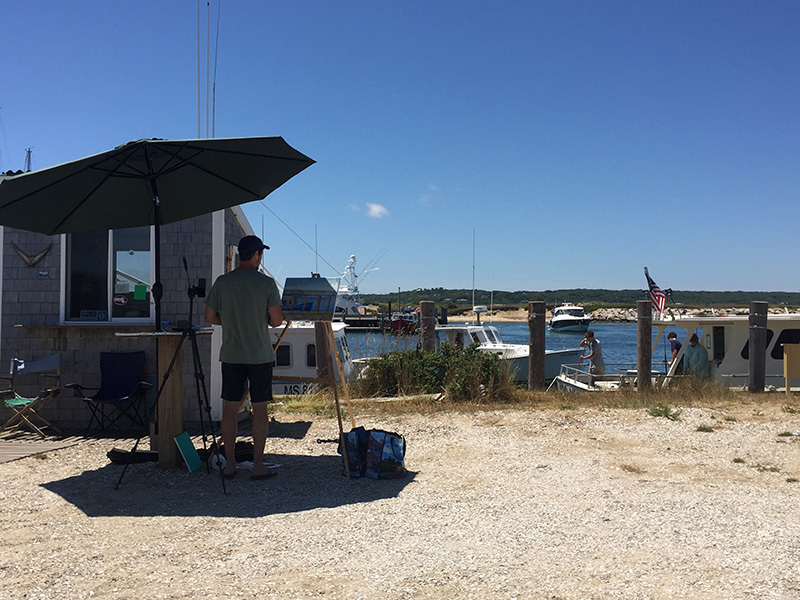 Magi comes to the Island about four times a year to work on studies for larger paintings and take photos to use as reference for her artwork. She stays a week each visit, and always with friends, though she’s never lived here. Learn more about her at magilelandartist.com.